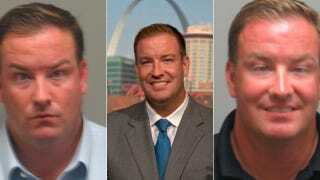 Two Sundays ago, Fox Sports Midwest's Dan McLaughlin was arrested for driving drunk after he crashed into a stop sign in Chesterfield, a suburb of St. Louis. He was suspended from work, even though FSM doesn't carry postseason games so his year was effectively over. That mugshot, on the left, is the face of a man who knows he needs to find a new job. But it's the crosseyed mugshot on the right that we're focused on here. That comes from McLaughlin's first DWI arrest, in August of 2010. The Riverfront Times just now got their hands on the police report (viewable below), and it's not flattering. "I noticed his pants were saturated both front and back in the crotch area. I asked about it and he said it was sweat. it should be noted, he did not appear to be sweating anywhere else. When asked again how much he had to drink, he said, 'Nothing,' and then changed it to, 'Not much.'" There's more goodness, like McLaughlin pulling the "do you know who I am," and even offering the arresting officer money to forget about the whole thing. But once you've pissed your pants, no one's ever going to call you Dan McLaughlin the Cop-Briber.